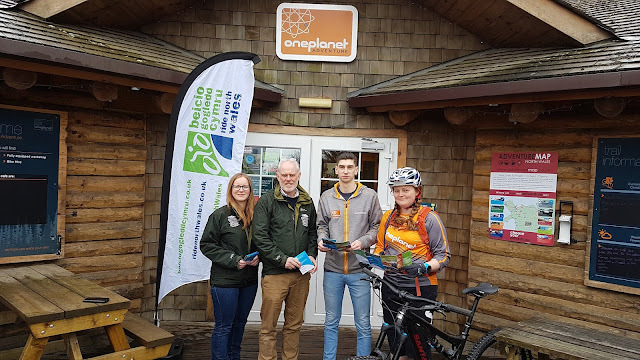 * The campaign is launched at Oneplanet Adventure. A campaign aimed at protecting the heather moorland in parts of south Denbighshire has been launched. The Sustainable Access campaign aims to prevent further damage to the moorland, which is being eroded due to an increase in use. Over recent years the area of moorland around Llandegla and Eglwyseg is being used as a popular route into Llangollen. As a result the paths and animal tracks are being damaged and the heather moorland is degrading. This has an impact on wildlife in the area, particularly ground nesting birds. Now the Clwydian Range and Dee Valley Area of Outstanding Natural Beauty team and Ride North Wales, in partnership with Oneplanet Adventure who run the mountain bike centre at Coed Llandegla are launching a campaign, which encourages cyclists and other users to stick to official routes. The campaign includes videos highlighting some of the problems caused, a series of social media activity aimed at cyclists and other countryside users. Councillor Tony Thomas, Cabinet Lead Member for Housing, Regulation and the Environment, said: “The stunning countryside and unique terrain attracts thousands of people every year. This campaign is asking them to stick to the Trail Users Code and follow the designated official routes. "We want to protect this unique landscape and prevent any further damage to the paths, the heather moorland and the wildlife that has made the moorland their home. “This landscape is unique, but it is also fragile. That is why the AONB and its partners have been working to protect this unique location, but need the public’s help too. “We appeal for people to be considerate of the countryside and work together to protect it for future generations."